Pattern will be on sale and available for purchase Monday, August 13, 2018. 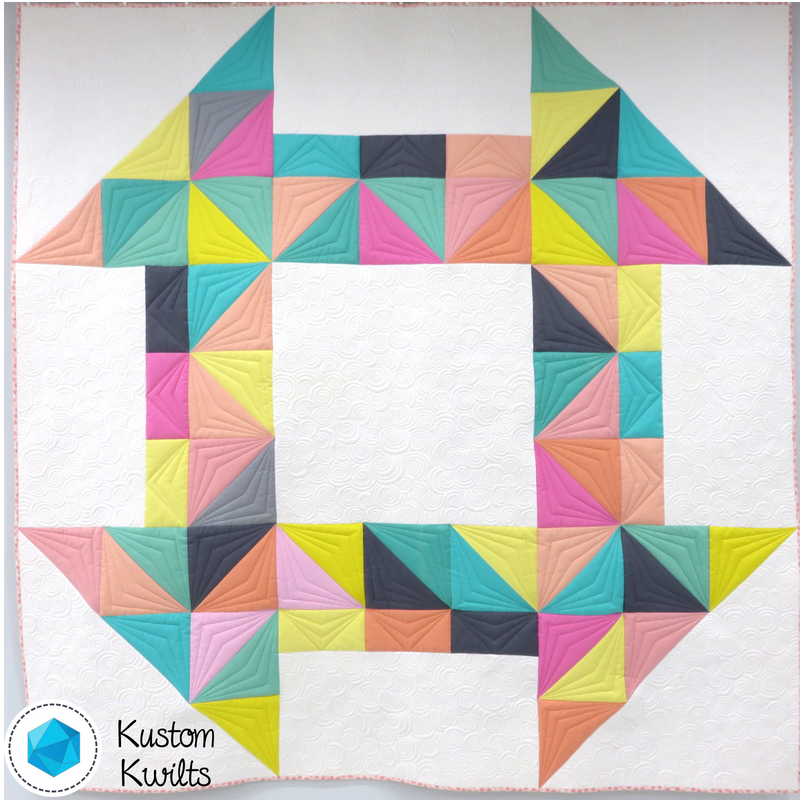 The Cheeky Churn Dash Quilt Pattern is my newest pattern with a fresh color palette. One of the very first quilts I ever made was a traditional churn dash quilt, and I just love that block. My mom and I gave the little churn dash quilt to my Mamaw Florence for her birthday one year, and then I got the quilt back when she passed away. You’d think churn dashes would make me sad, but I smile and think about what an amazing Mamaw I had and how much I miss her. She was such an inspiration to me and was an awesome artist. This quilt is kind of my tribute to her. 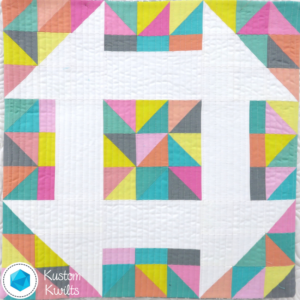 I really like traditional quilt blocks with a modern spin, so what better way to make a big churn dash made up of other blocks to show off your favorite fabrics? This pattern was first featured in Love Patchwork and Quilting magazine. You can pick up Issue 54 or find the pattern in my Pattern Shop. Cheeky Churn Dash is a really fun pattern to put together, and by joining in the quilt along, I’ll introduce you to an awesome new way to sew together half-square triangles. You’ll seriously be amazed, and you’ll want to use this method all the time! There are two layout options for making the 81″ square quilt, mini, or pillow, and you can choose the one that you like the best. 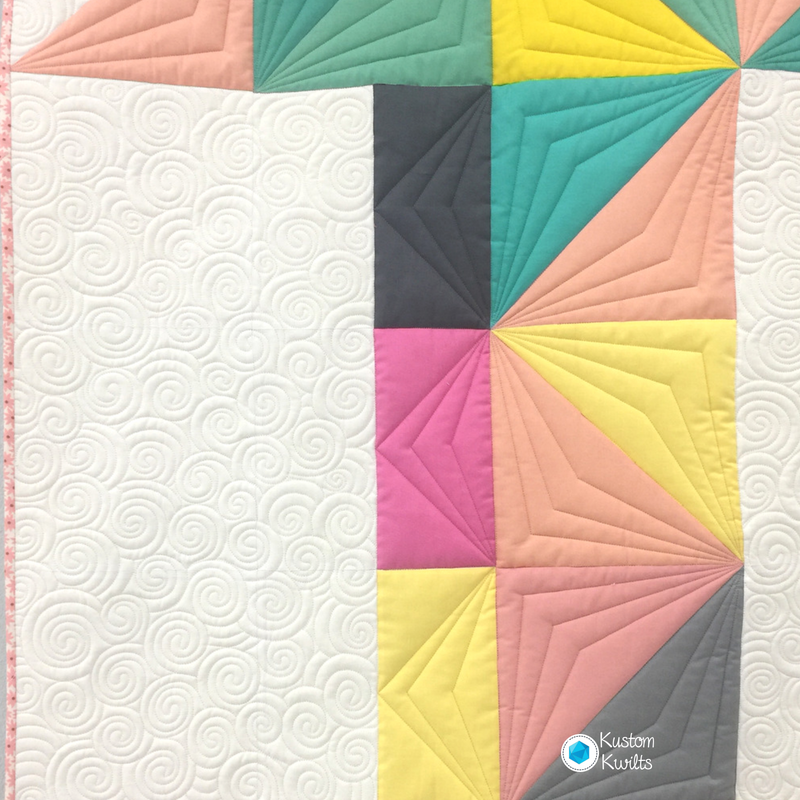 The quilt is layer cake friendly and the mini and pillow versions are mini charm pack friendly–great for quick piecing. This is a great way to use up your favorite fabrics that you’ve been hoarding for ages! And there is a Quilt Along for this pattern that will start in September. RSVP to the quilt along to sign up for all the details and save your spot! The Cheeky Churn Dash PDF Pattern in my shop includes coloring diagrams for easy planning, fabric cutting diagrams to make the most of your fabric if you aren’t using precuts, and tons of step by step pictures that will make this quilt a breeze. I quilted my Cheeky Churn Dash Quilts in a couple of different ways–one of my favorites was just straight line quilting. It’s modern and simple and really shows off the quilt without distraction. I quilted another version with some geometric lines and swirls in the background fabric. There are so many great options for quilting this quilt, the sky is the limit! This is a quilt pattern I found online that I just love! It is designed for a baby, but I’m tempted to keep it for myself ;). It was a joy to make and the colors are very playful and fun.